When you really think about it, Christmas is a holiday jam packed with strange traditions. A jolly, fat man who comes down the chimney in the dead of night to deliver gifts? Hanging old socks from the fireplace mantle in hopes that they’ll be filled with trinkets in the morning? Both are odd, that’s for sure, but no tradition is stranger than chopping down a tree, dragging it into the house, and decorating it with hundreds of colored ornaments and lights. But as odd as it may seem, the Christmas tree is still my favorite part of the holiday. And with trees ranging in price from $25 (for the sickly little real ones) all the way up to $500 (for the spectacular fake ones), it can also be pretty costly. I’m a real tree kind of gal (always have been, always will be), but the easiest way to eliminate the annual $50 to $75 cost of buying a real tree is buy buying an artificial one. Sure, there’s the initial cost of the tree, but after that, it’s paid for. You just have to drag it out of the attic and set it up. And the best part? No pine needles on the carpet. 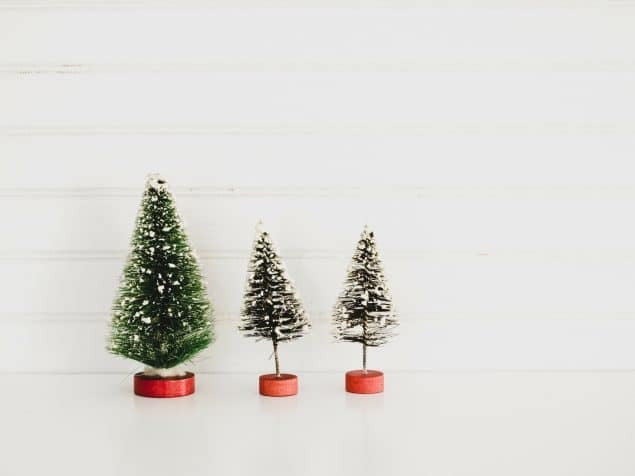 Even though a good artificial Christmas tree will cost anywhere from $100 to $300, you can cut that cost in half by buying your tree in the days after Christmas when stores slash prices on their holiday stuff. You can also shop your local thrift stores to find great deals on fake trees. While you’re at it, feel free to stock up on wrapping paper and decorations for next year! If you’re buying a real tree, you’ve got two options: The tree lot at the mall (or dozens of other places in your area) or a cut-it-down-yourself tree farm. Prices vary widely at both places, so be sure to shop around to find the best deals. Expect to pay anywhere from $5 to $10 per foot, depending upon the type of tree and where you live (you don’t even want to know what people pay for real trees in Hawaii!). If you have a backyard or some woodland with a selection in it, you might consider finding and cutting down your own tree. Total cost: Absolutely nothing! Of course, that’s assuming you can find a suitable tree. You might have to make some compromises when it comes to finding the “perfect” tree, but you can’t beat the price, right? If you do decide to chop from your own stock, be sure to plant another tree it its place. In two or three years, it should be ready for its Christmas debut! Do you have any tips on saving money on a Christmas tree?